This example takes more patience but is stiill very easy. I just cut out patterns or medallions from doilies and used double sided tape (my fav) to decorate a store bought mat. These are the "tools" you will need to "mat" a picture or other momento witth a paper doily. This doily was just a bit wider then the frame I selected to use. This is a vintage picture of my grandmother and her sister from about 1915. I used a small piece of double sided tape and "centered" the picture on the doily. I then layed the doily "face down" on the frame with glass. Voila! so pretty and easy! In this example I used a smaller doily and added a piece of fabric behind (you can use construction paper or other scrapebooking papers too!) the doily. Use the back of the frame as the template to cut the backing fabric or paper. First add picture taped to doily against glass, then add fabric or paper. Last the frame back. Another look for a well loved picture! A Princely paper doily crown! * If pipe cleaners are unavailable you can substitute a stiff strip of paper or ribbon. Place pipe cleaners around head and twist ends for appropriate fit. Fold doilies in half and place an inch piece of double sided tape along edge of fold. Fold doilies around the adjusted pipe cleaners (or paper/ribbon), to form a circle. I like to overlap them abit. When you've completed this - more double sided tape can be added to secure the doilies as you see necessary. 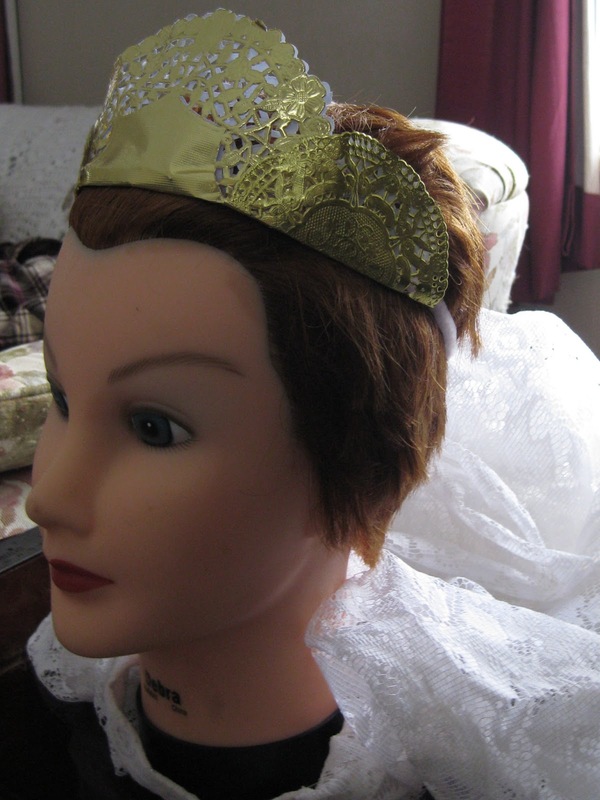 Voila - ready for the coronation! A Princess tiara made from gold foil doilies! Easy - and fun to make for children's birthday or tea parties! 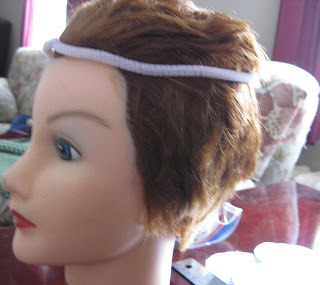 *If pipe cleaners are not available a flat piece of stiff paper or ribbon can be used to attach the doilies to. Fold all three doilies in half. Add a piece of double sided tape along the inside fold of doily. Twist the ends of the pipe cleans together to form one long piece. Use the largest of the three doilies - and place the pipe cleaner across the inside fold by the double sided tape. Fold the doily over the pipe cleaner. Repeat this process with the two smaller doilies along each side of the larger doily - I overlapped mine a bit. If you need to add bits more of double sided tape to the doilies once assembled go ahead! The two "loose" ends of the pipe cleaners are twisted to the "perfect" size! around the head of the princess! SO PRETTY! But at this point you can further embellish with sequins, sparkles whatever! A tea for one all the more lovely with doilies! 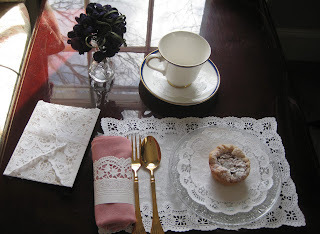 Note the doily napkin ring. Easily "made" with a small section of approximately 6" of lace paper doily border. If you don't have any border paper handy cut a narrow strip from any other "straight" side doily you have. Note the tiny doily under the cup. Both practical and beautiful. A simple tart looks so much more special presented on a crisp white lace doily. Can you come to my tea party? An invitation wrapped in lace. Very simple and elegant way to add your own touch to basic invites! DOILY TUSSIE MUSSIE CONES TO YOU! A tussie mussie is a victorian bouquet - but we can create one to be used for holding petals, rice or bird seed to toss at a wedding! These cones would even be a creative way to "serve" treats or snacks an informal party - imagine pop-corn or jelly beans! I think my pictures are pretty self explanatory. When I become more comfortable with the blog format I hope to add videos of more complicated projects. Where to find great Doilies!